iTunes U is the new innovative way to get students more interacted into education. iTunes U is a great way for students to learn from lectures, language lessons, films, labs, and audiobooks to tours. 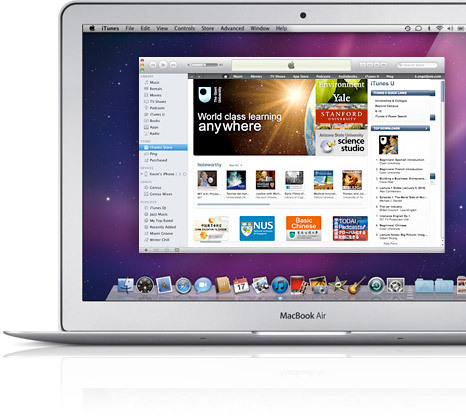 More than 800 universities have an active iTunes U site. Some of these universities include UC Berkeley, Yale, MIT, Oxford, and Stanford. These schools are very distinguished and have been honored with many awards. Students can learn from iTunes U because many professors go on virtual tours of places where the students learn from. Such as the Galapagos Islands which is a great place to learn about animals and more. People who want to learn about different areas of a certain field can go back and replay the lecture the professor taught. iTunes U gives you a wide range of options to make changes to your site. They also give you ideas whether to use a PDF file or the ePub format. When using a PDF file, they tell you to use it for distributing brochures, flyers, or illustrated manuals. For text based papers, reports, and books, they advise you to use the ePub format. Many teachers have found that basic lectures are not enough to capture the kids’ minds. Many teachers and professors have found that virtual tours are very useful in giving the student a real look into what actually happens. Words can only take a person so far, images can take them farther.